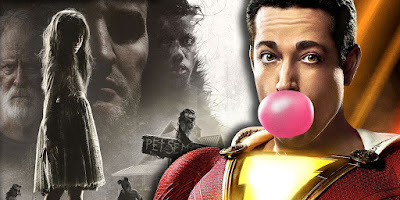 This weekend sees the DC hero Shazam! do battle against the latest adaptation of Stephen King's Pet Sematary. While both are doing well, only one can be the true champ. And it appears that the superhero will beat the undead cat and his family, handily. With a massive marketing push from both camps, it looks like DC's latest cinematic entry is going to top the box office with nearly $51 million with an additional $3.3 million from early fan event screenings. This sets the film over $54 million in its opening frame, which still doesn't make it a huge success for WB, but gives them a solid foundation that's been critically revered across the board. The film scored $20 million from Friday night showings alone. Whether or not it has legs for the long haul remains to be seen. Taking the second spot, right behind Shazam! is the modern update of Stephen King's novel, Pet Sematary. Directed by the folks behind 2014's Starry Eyes, Kevin Kolsch and Dennis Widmyer, the remake changes some core elements from the novel and the original movie. The film estimated to hit the $23.5 million mark this weekend after pulling in $10 million on Friday. Sadly, this is nowhere near the opening numbers for the first chapter of the IT remake. Perhaps the mixed critical response has something to do with this.